This example house is a single story, rectangular shape, pitched roof with ventilated attic, and built over a vented crawl space. Heating fuel is Propane at $2.20 per gallon with an 80% efficient gas furnace. Furnace ducts run through the attic and are not insulated or sealed. This example is a bit extreme, in that it combines poor insulation, poor windows, poor sealing, a not so efficient furnace, un-insulated ducts, and an expensive fuel. Someone living in this kind of climate with this kind of house would probably have already done some upgrades, but the example is intended to give a rough idea how bad things can be even for a modest size house. Example 2 (below) shows how a good set of well planned and well executed upgrades can help a lot. Floors R19 fiberglass bats -- an effective R value of 28 (50% over R19) is used due to the buffering effect of the crawl space. Infiltration An estimate of 1 air change per hour is used -- this might be typical of an older home that had not been worked on for better sealing. (1) The wall R value ignores the beneficial effect of siding, sheathing, sheetrock, but also ignores the negative effect of thermal bridging by the wall studs and framing, and air currents in fiberglass. 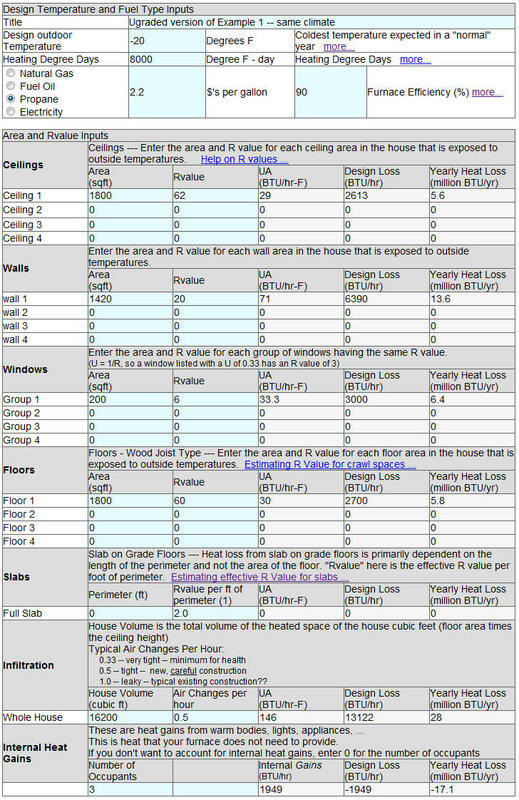 The Whole Wall R value calculator would allow you to do a more exact estimate. So, the total heat loss per year is about (149.7 - 17.1) = 132.6 million BTU per year (where the 17.1 is internal gains from the last line of output). The total heating bill is about $5967 - $680 = $5287. A furnace with an output of 70000 BTU/hr should be adequate for the design condition. While this is a rough estimate, it shows how badly a poorly insulated and sealed house can be to heat at today's propane prices. 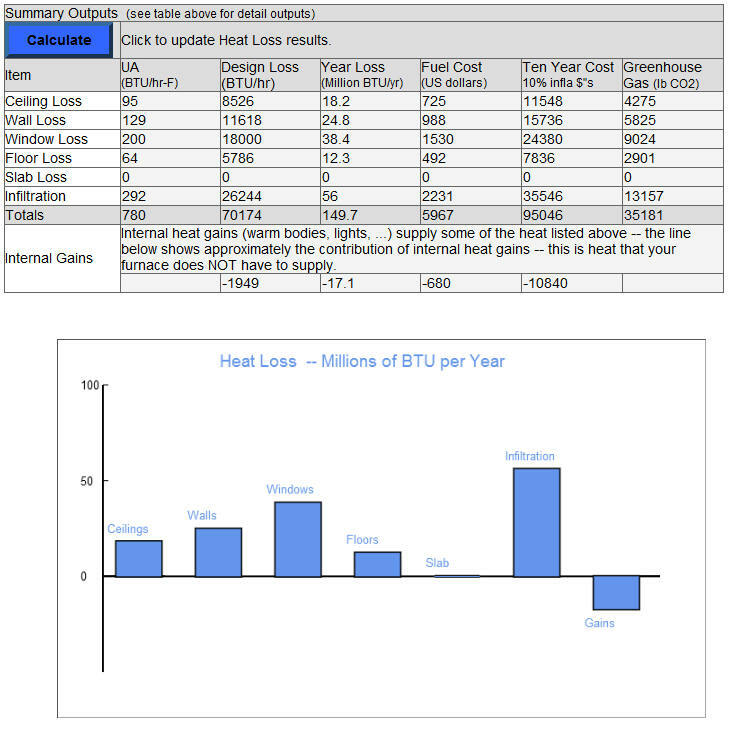 The same house (as nearly as I could) run on the HOT2000 home heat loss estimator comes up with 160 million BTU/yr compared to the 150 million BTU/yr for this calculator. Start with Example 1 (above), and do some extensive upgrades. Add the Mooney Wall upgrade to the walls to provide a true R20 wall with minimal thermal bridging. Install new double glazed, low e windows, and use "energy track" thermal shades for total effective R value of about R6. Change crawl space to an un-vented conditioned space with additional rigid foam board insulation on the crawl space wall. It is hard to estimate the total R value for this, but it should reduce floor losses to near nothing -- I will use a total effective R value of 60. Caulk all window and door frames, and other penetrations to the outside. The Mooney wall dense packed cellulose will also help with air infiltration. While its hard to estimate the end effect on infiltration, I have reduced it to 0.5 air change per hour. Replace the furnace with a new 95% efficient condensing furnace (which could be much smaller than the old one). Seal and insulate all ducts going though the attic. Seal every other duct area that can be accessed. I've used 90% for an effective furnace efficiency including a little duct loss. So, the total heat loss per year is about (59.4 - 17.1) = 42.3 million BTU per year (where the 17.1 is internal gains from the last line of output). The total heating bill is about $1577 - $454 = $1123. 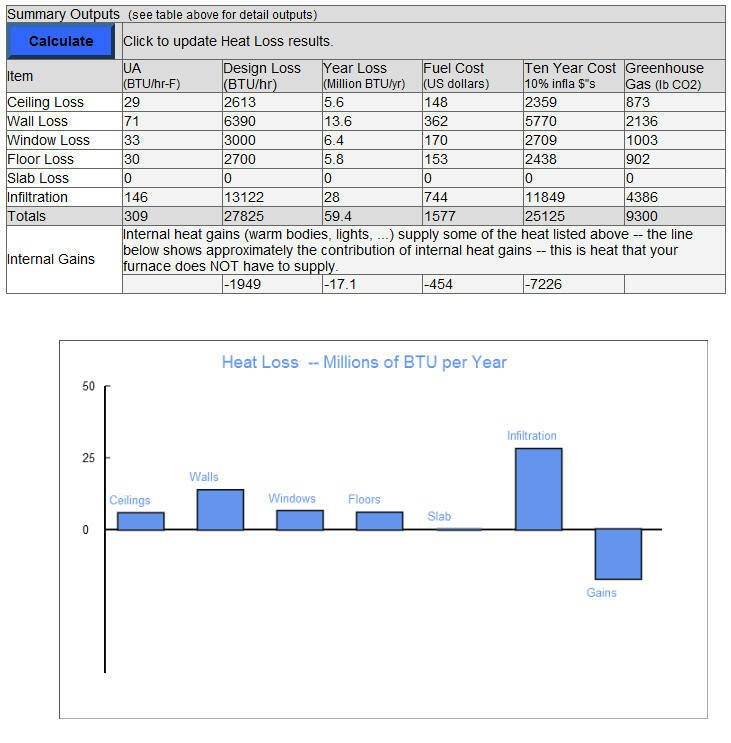 So, from Example 1 to Example 2, the total heat heat loss per year is reduced from about 132 million BTU to about 42 million BTU/year (a 68% reduction). The combined effect of much lower heat loss and more efficient furnace/duct system reduces the heating bill from nearly $5000 down to $1100! Note also the 11 ton reduction in CO2 emissions. OK, this is an extreme example that starts from a very thermally bad home and upgrades to a very thermally good home. And, your results may certainly vary. And, there are lots of potential error sources. 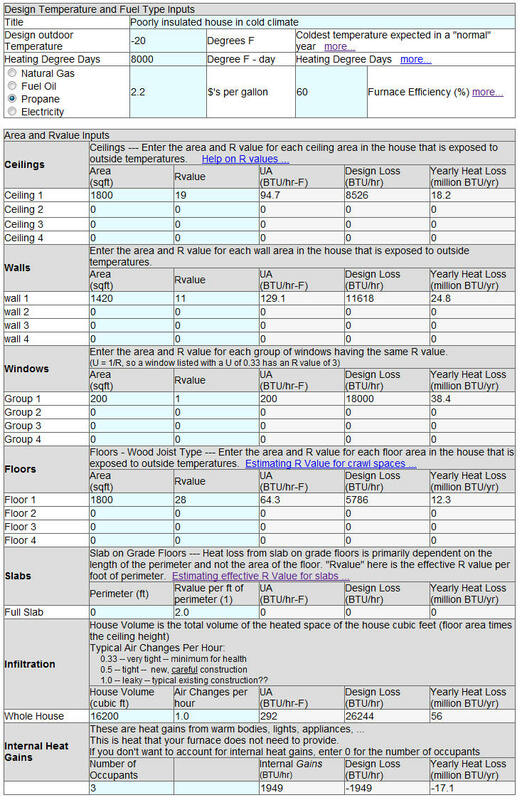 But, it does give an idea of the potential savings for a well planned set of upgrades to a thermally inefficient home. One could consider adding a low thermal mass sunspace to provide some additional heat for the house and reduction in fuel use.